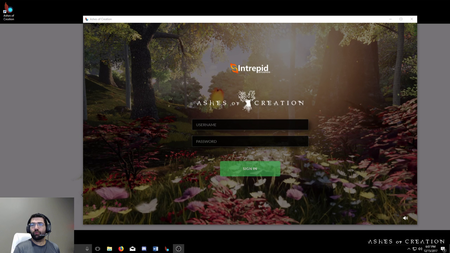 Alpha-0 is a NDA pre-alpha release of Ashes of Creation. This is the first of many internal tests of the networking, backend and node system. Establishing core technical features for the back-end solution. Connecting many players into a single zone with 4,000 NPCs. Getting good server framerate performance. Making the connection through the launcher end. Establishing the core node system collection cultural experience. This release is also known as the "friends and family alpha". Alpha-0 is the invite-only "raffle" alpha that also grants access to some media and influencers. Alpha-0 is a part of Pre-alpha testing. Alpha-0 footage from livestream, 31 October 2017. 1,200 to participate in Alpha-0 starting Friday 15th of December 2017. The alpha-0 map is divided into three Knotenpunkte, each with a ZOI. Only one node will be capable of reaching the Village stage. 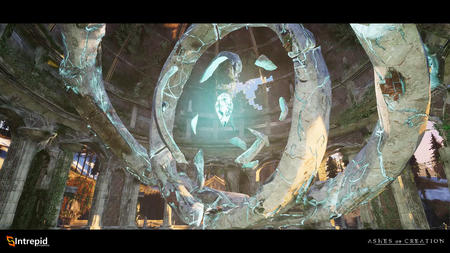 In Alpha-0, players will start at an Empyrean divine gateway. Alpha-0 river that runs through the center of the map. 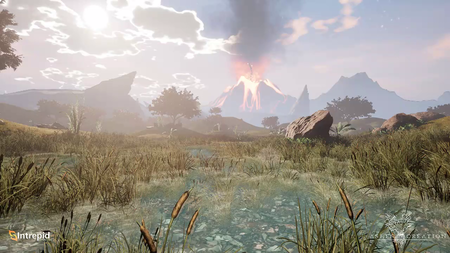 There are four over-world environments (climates/biomes) in Alpha-0. Alpha-0 Unterreich preview by Trystan Snodgrass. 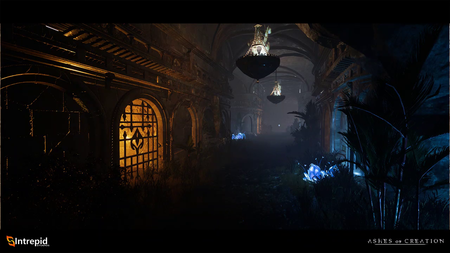 Alpha-0 has a bio-luminescent Unterreich environment. Four playable archetypes: Kleriker, Magier, Waldläufer, Tank. 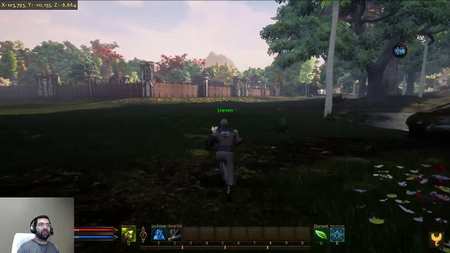 Players will experience some degree of progression in Alpha-0. Leveling will be from level 1 to level 10. 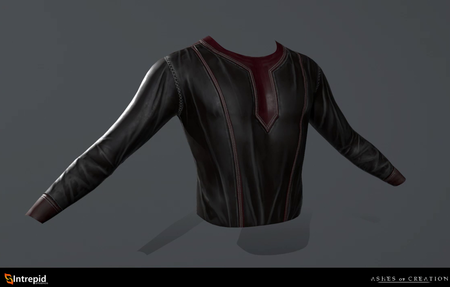 There will be a tier-based skill progression where players can apply points into individual skills. 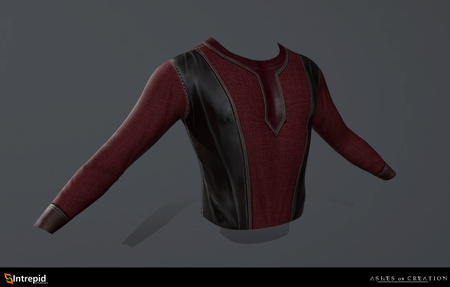 Sammeln and crafting was originally intended to be in Alpha-0, but due to time constraints these were not included. The weapon use ability (precision combo/quicktime event) system is in Alpha-0 but it is a different iteration to what was shown at PAX West 2017. Due to time constraints leading up to Alpha 0, the success range of this system was widened and the UI component was disabled. 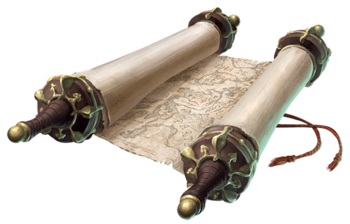 The plan moving forward is to continue to evolve the system in a fun and more engaging direction based on community feedback. Many animations at the moment are first pass, and will be further fleshed out as development continues. Alpha-0 Dünir (Dünheim) dungeon design by Michael Bacon. There will be three open-world dungeons in Alpha-0. Mobs will scale with node advancement. The party size in Alpha-0 is six (6). An additional 100 km2 may be taken up by the Unterreich. The Alpha-0 NDA restricts the sharing of visual elements from Alpha-0 testing. There may or may not be a pair of sandals; if found will grant you some major boon or benefit... You might need a utility skill to find them. Sicherheitssysteme will be in place to combat cheating, exploiting, botting, gold selling, item duplication and other things that affect the economy starting from Alpha-0. 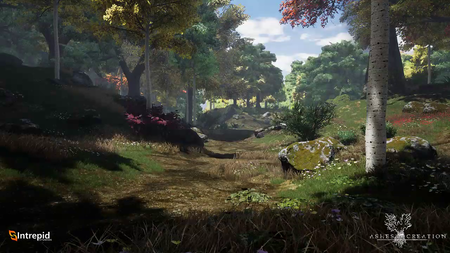 Alpha-0 will utilize DirectX 11 or DirectX 12. UE4 allows us to do from a graphical fidelity standpoint is create a beautiful world on the front end. ↑ Livestream, 15 December 2017 (3:48). ↑ Livestream, 20 October 2017 (50:20). ↑ 5.0 5.1 5.2 5.3 5.4 5.5 Livestream, 3 September 2017 (30:31). ↑ Livestream, 17 November 2017 (4:52). ↑ 7.0 7.1 7.2 7.3 7.4 7.5 Livestream, 8 April 2018 (PM) (41:44). ↑ Livestream, 15 December 2017 (15:00). ↑ MMOGAMES Interview, 8 September 2017. ↑ Livestream, 31 October 2017 (24:19). ↑ Livestream, 17 November 2017 (30:34). ↑ Livestream, 15 December 2017 (1:11:52). ↑ Livestream, 3 September 2017 (33:28). ↑ 15.0 15.1 Livestream, 16 October 2017 (11:41). ↑ Livestream, 16 October 2017 (12:08). ↑ Video, 22 January 2018 (0:01). ↑ Livestream, 15 December 2017 (1:36:53). ↑ Livestream, 18 January 2018 (14:00). ↑ 21.0 21.1 Livestream, 17 November 2017 (14:57). ↑ 22.0 22.1 22.2 Livestream, 3 September 2017 (37:10). ↑ Livestream, 15 December 2017 (1:02:22). ↑ Livestream, 15 December 2017 (1:02:50). ↑ Livestream, 18 January 2018 (22:50). ↑ 31.0 31.1 Livestream, 18 January 2018 (22:46). ↑ Livestream, 17 November 2017 (17:50). ↑ Livestream, 15 December 2017 (1:33:13). ↑ Livestream, 16 October 2017 (49:28). ↑ 39.0 39.1 Interview, 17 August 2018 (10:43). ↑ Livestream, 17 November 2017 (17:34). ↑ Livestream, 15 December 2017 (1:34:41). ↑ Livestream, 8 April 2018 (PM) (44:11). ↑ Livestream, 4 May 2018 (40:47). ↑ 52.0 52.1 52.2 Livestream, 9 February 2018 (20:40). ↑ Livestream, 17 November 2017 (28:06). ↑ Livestream, 3 May 2017 (27:21). Diese Seite wurde zuletzt am 10. Februar 2019 um 21:20 Uhr bearbeitet.